Ugh! Sorry I haven’t been around– MMM has taken a little hiatus chez Ginger. Poor Man Friend came down with a nasty case of the flu, so Doug the Pug and I spent the last couple of days playing nursemaid. He’s feeling better today, so we’re trying to get things back to normal. I didn’t want to disturb Man Friend with noise from the sewing machine, so I did a little knitting while he rested. Since MMM started, I’ve realized that I’m seriously lacking in the cardigan department, so I started the Honey cardigan. I had started this a while back, but realized too late that the yarn I was using wasn’t really the right choice for the project and frogged the whole thing. I’m re-knitting it in good ol’ Cascade 220, which is working out beautifully so far. Hopefully I’ll be able to finish this quickly and get a little use out of it before it’s too warm! I also started watching Kenneth King’s Jean-ius course on Craftsy. Man Friend wanted to know what I was doing, and asked if I could copy his favorite jeans for him. He got really excited about picking out topstitching thread and rivets, and can’t believe it’s possible to sew jeans (haha, I guess we don’t actually know that, do we?). I’m really looking forward to making him something, especially something that he’s really excited about. We’ll see how it goes! What are you guys working on these days? I hope everyone is well (and flu-free– yuck!)! « Ginger Made: Tiny Pocket Tank + Me-Made-May ’12: Day 8! I am working on incorporating “frog” as a verb into my daily speech. I salute you in this endeavor! Godspeed! I’m working on the Jean-ius course too! Albeit slowly. I was hoping to get back to it on Wednesday, but ended up spending the entire day on finishing up another project (which I haven’t had a chance to post yet.) Hope everyone’s feeling healthy and happy again soon! I have a feeling I’ll be taking it really slowly (I’ll be away next week, and may not really get to dig in until MMM is over). Good luck! I hope you enjoy it! Yay for knitting and jeans! Your cardigan’s going to be lovely. What a great colour! I can’t believe you’re not only making jeans but making them for your man! Yikes. My other half is still waiting for the waistcoat he asked for! I spend so much time sewing that he deserves something for putting up with it! Can’t wait to see how your jeans turn out! I’m basically terrified to even attempt making them, but I’ve always wanted to! I’m really excited! Truthfully, I’m looking forward to doing boy jeans first since the fit doesn’t have to be quite so precise. He’s feeling good today! Thanks for the good wishes! I hope Man Friend is feeling all better soon! I love your cardi too! Wow, that’s some beautiful knitting. I can knit in a straight line… very dull. Thinking of getting the Knit Lab course from craftsy so I can knit myself an interesting scarf. Plus I know nothing about wool selection etc, so I guess this will be a good place to start. Can’t wait to see your cardi finished though, it will be motivational inspiration for a beginner like moi! Hmm, I can’t speak to the Craftsy course, but I would definitely recommend that you sign up for Ravelry.com if you haven’t already! You can find patterns and get suggestions for proper yarn as well as reviews and tips from people who’ve already followed the pattern. So helpful! Thanks, ma’am! You should try jeans– I bet you would knock ’em out of the park!! I love to knit as well, very pretty work! I’ll have to check out that Jean-ius course, so cool! Definitely check it out– it’s very interesting! Thank you! He’s feeling great now– thanks for asking! That’s a beautiful color! Oh my. I really like that cardigan. I haven’t knit in months until last week when I knit up a bunch of washcloths and was like, “oh yeah, I forgot how much I love this.” Sooo, I need to get back to it! 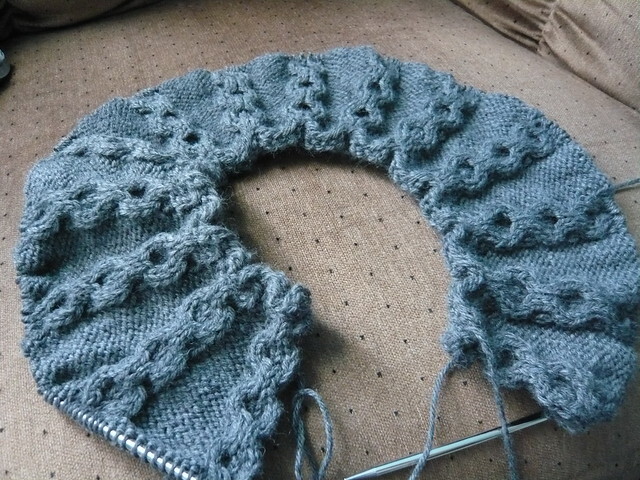 I go for long bouts without knitting, too, and it’s always nice to dive back into an absorbing project. Your cardigan is looking beautiful…what a lovely colour!!! So how is the Jean-ius course? Would you recommended it? So far so good– very approachable and not intimidating at all! I’m taking it very slowly, though, as I’ve got a couple of other projects with deadlines coming up.